When you lose your sight as a result of negligence, it can be reassuring to know how compensation can help you adjust to a new way of life. Lucy Crawford explains the 6 ways it can go towards changing your life for the better. Nothing can prepare you for losing your sight; it’s completely life-changing. Some people compare it to bereavement and you may experience similar emotions such as denial, anger and fear. However, injury solicitors can help you get the most out of your claim and help you live your life to the fullest. 1- A guide dog – The Guide Dogs charity train their dogs to help provide independence and freedom to the blind and those partially sighted. The dog will become your eyes and allow you to carry out the everyday tasks. Guide dogs can also offer great companionship as you adjust to your new life, at a time when you need it most. The loss of identity is a common feeling when you loose your vision. Tasks that you would once have enjoyed, whether it is taking your children to the park, or playing football on a Saturday morning, will seem impossible. Having a guide dog to support you through this may help you regain and adjust your sense of identity. 2 – A GPS personal tracker – this can monitor your location using Google Maps, make two way phone calls, and checkup on the holder to set geographical fences. It also has an SOS button and a fall alert so you can have your independence, with peace of mind that if anything happens you can get help. Anxiety is another common emotion when confronted with sight loss. This tracker may help you feel more in control of your day to day activities and prevent the panic from setting in when you leave the house. 3 – Voice-control instruments – these can be installed into your home so that everyday things – such as turning the lights on, opening the curtains, or turning up the heating – can all be controlled with your voice. By having these helping hands in your own home, and knowing that you can still live an independent life, this may help with your long term mental wellbeing and help reduce the grief reaction that is common when first confronted with sight loss. 4 – Bump-ons – these are little raised buttons that stick to almost any smooth surface. They will help you identify the buttons you need on your everyday appliances. 5 – Liquid level indicators – these are a popular device. They sit on the top of your mug and as you fill the mug with liquid it will alert you to when you’re nearly at the top! 6 – Big button phones – both landline and mobiles are available these days. Give them a try, some will suit you and some won’t. Whatever you decide, don’t be alone; there are always people that can help. How do you know whether sight loss is as a result of medical negligence? Eye injuries can occur for a number of reasons. These could include eye trauma, cancer, inflammation of the optic nerve, damage due to diabetes, glaucoma or a brain injury such as stroke. Whilst many causes of sight loss are linked with your general health, such as smoking and diet, it is essential you attend regular eye tests to monitor any deterioration or pick up abnormalities. For many conditions, the earlier you can detect a problem, the quicker you can begin treatment and the better the outcome will be. However, sometimes problems can be missed, or mistreated. If you feel that you have been left visually impaired because of treatment that you have received from your GP, hospital or optician, then you might be able to make a claim. If you are successful with a claim it will enable you to either help alleviate your symptoms, or assist in adapting your home and surroundings. The circumstances of the accident, or negligence, will carry some weight on the amount of compensation that you receive. However, in most cases it is the extent of the lasting injury that will be the determining factor. Damages are awarded in two different categories for the loss of sight. The first is general damages. These will assess and quantify the avoidable pain, suffering and loss of amenity. Where a person fully recovers from their eye injury within a couple of weeks the claim may be somewhere between £1,700 and £3,400. 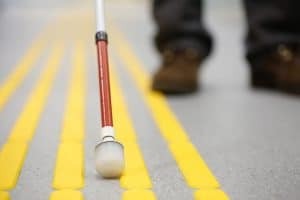 However when a person has been left totally blind and deaf as a result of their injury, these injuries will be ranked as most severe and devastating, and their claim could be worth anything up to £350,000. The second category is special damages; these are economic losses that you have suffered as a result of the eye injury. In most cases the main loss with be earning capacity. The My Voice Survey done by RNIB in 2015 revealed that one in four people registered with sight loss and of working age are working. This is down from one in three ten years ago. Along with earning capacity, any care received, as well as fuel and parking costs procured among other things, can all go towards calculating special damages. If you’ve lost your sight unexpectedly as a result of medical negligence, we hope this helps you understand the options that are available to you. If you’d like to find out more about how to make a claim for compensation, please get in touch with one of our team of legal experts today.